We’re happy to announce that we added the NRA Home Firearm Safety course to our catalog. This course is special as it differs from most NRA classes in several ways: it’s a non-shooting course, so it’s perfect for people who still haven’t completely made up their minds to fire a gun. This way, you have a low-cost option to become acquainted with firearms, without being pressured to fire them. Plus, after knowing a bit more about the different categories of arms, it will make it easier for you to decide which firearm to start with. 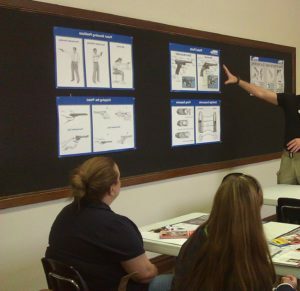 The class is also very useful for those who live in places where it’s illegal to shoot handguns without a permit. The second difference is that this class covers numerous firearm types (Rifles, Shotguns and Pistols), so you can compare and decide what suits you best. Lastly, this class can be held practically anywhere, anytime, as no special arrangement for a shooting range is necessary. It can be in a local venue, or even in your own home! To schedule a class, and for more information, please contact us. In the meantime, you may want to follow us on social media to keep up with what’s new and exiting in the world of firearms.